This gorgeous vintage-looking ornament comes in a kit designed and created by the good people at The Cracker Box in Blooming Glen, PA. They call this beauty The Blue Danube which includes a video of how to put it together…with The Blue Danube Waltz playing in the background, of course. On our first visit to Vienna, we were expecting our daytime cruise on the Danube to capture the lilting waltz of Johann Strauss. How disappointing! The water was NOT blue, but BROWN! On a later visit, we took a local’s suggestion, and boarded a river cruise at NIGHT! WHAT A DIFFERENCE! The lights of the city reflected gold, and the water DID look blue. We even heard violins. But that’s probably because we are hopeless romantics. The Cracker Box opened their craft shop with a few of their ornament kits back in 1970. 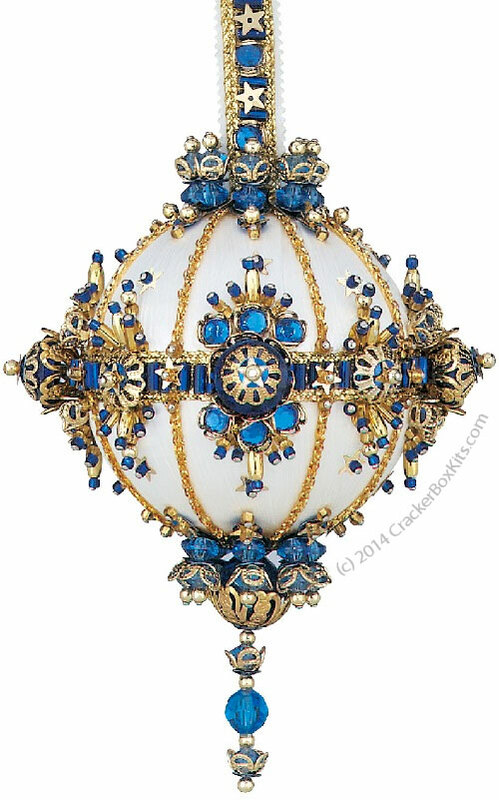 Now they offer hundreds of their exquisite ornaments kits via their online gallery. Like the mighty Blue Danube, let us give our blessing to everything and be the picture of peace for all time.